According to traditional Chinese medicine, raw produce are cooling in nature, and if you chronically feel cold or often get colds, or just had a baby, you may want to lay off a high intake of raw foods. Instead, eat the greens cooked, enjoy more soups (pureed carrot or broccoli soups are good), and warming ingredients, such as garlic and ginger. If you have problems with diabetes, hypoglycemia, or high blood sugar levels, and are super sensitive to sugar, make sure to follow recipes that are lower in high-glycemic fruits, such as bananas, and higher in protein and fats (such as flax seeds and a good quality protein powder) for your green smoothies, if you choose to drink them. If you have had problems with kidney stones, be careful with green smoothies, especially if they are made with spinach or swiss chard because those two types of greens are very high in oxalates, which can cause stones to form. “The omega-3 fatty acids and cod liver oil are also very effective in preventing oxalate deposition,” according to William Shaw, PhD in his article “The Role of Oxalates in Autism and Chronic Disorders.” So if drinking green smoothies makes you feel good but you are concerned about ingesting too much oxalic acid, you may try mixing in some cod liver oil. 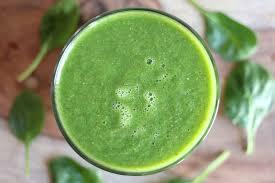 Who Are Green Smoothies Good for? If you are extremely active (like I was when I was dancing full-time), having a green smoothie mixed with coconut water may help nourish your body, replace enzymes lost when sweating, and cut your cravings. If you do not absorb your nutrients well and need to hydrate and nourish yourself with high doses of anti-oxidants, then green smoothies may be the perfect food for you. Drink it slowly, at room temperature, and try chewing your smoothie. If you chronically crave sweets because of low energy or emotional tribulations, green smoothies made on the sweeter side may help you stave off a binge, especially if you add in some nuts such as cashews, a banana, and some blueberries. It will taste sweet, creamy, and wonderfully nourishing.